This month I am doing 2 story programs each week. The first is a sort of introduction to story time for some of the one year olds that have come to my "Mother Goose" and will be coming to the 2 year old's program in the fall. It's an easy program in some ways because since I am guaranteed a new batch of kids each year. So I have 4 planned programs I can just pull out week to week. And because it's just those 4 programs, it doesn't get boring to have to do the same stuff each year. Besides, when you're working with kids still in diapers, it never gets boring anyway--never know what they will do. My Mother Goose Time is a circle time without books. In this program I add books to the Mother Goose games, but I make sure that I pick books that have either action or lots of space for audience participation. 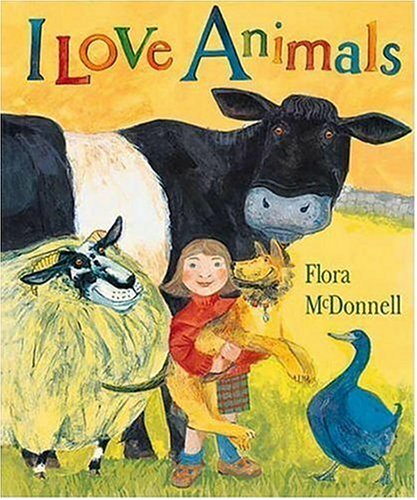 I am lucky to have a giant paperback of this book because I can prop it up on my easel and let the kids all ooh and ah over the bold pictures of some of their favorite animals. The text simply talks about how the little girl loves each of the animals ending with "I love all the animals and I hope they love me". We have fun pointing to small details and making the animal noises. The opening and closing spreads show the entire, very British farm and all the animals, plus a tractor for my machine loving boys. When this is over, it's the perfect time to pull out my basket of animal puppets. The kids are used to these from Mother Goose Time, where each week mid-way through the program I bring out some of the puppets and we sing "Down On Grandpa's Farm". But instead of singing that, this time I sang a Pete Seeger favorite, "I Had A Rooster", You can find the Folkways recording of Pete singing it here. And though I sang a different song, I still brought each puppet around the circle so that the kids could interact with them--some like to hug or kiss the puppets, others simply stare at them and a few almost hide! I fell in love with this book the first time I ever read it and I knew it was the perfect book to go with the "riding" games I play with the Mother Goose set. When I read it to the group, I suggest that the parents get the kids on their laps--if the kids are willing, that is--and play along. 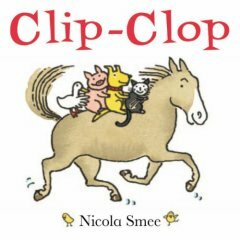 Horse takes first Cat, then Dog, then Pig and finally Duck on his back and gallops along "Clip-clop, Clippety-clop", going faster and faster until he suddenly stops and they all fly off into a haystack. "Oh, dear!" says Horse, but like toddlers reading this book, all the animals just shout gleefully "Again!" After this we play riding games: "Father,Mother and Uncle John", "This Is The Way The Farmer Rides" and my girls' favorite "Trot,Trot To Boston". The older kids (2 and up!) program is being done in the main part of my children's room, instead of in the story room. With the furniture cleared, it's a big open space where I use the occasional "big book", but mostly tell stories, with lots of props and some audience participation. I have had an oversized magnet board of this story for years, but it wasn't big enough to use with a large group. So I grabbed 2 straw hats, an egg shaker and various puppets and retold the story of the farmer who loses his hat, of the animals who see it as other things (a flowerpot, a boat, a flapping bird) and of the bird who thinks it's a nest. And of course the farmer can't tell Bird otherwise, so he gets a new hat instead! Since I had the egg shaker out, I brought out the whole basket and we did Nancy Stewart's Egg Shaking Song. The only problem with doing this is that I have no helper, and when you have 40 something kids, it takes a while to hand out all those eggs. I am looking forward to having my daughters help this summer! Another Pete Seeger song I love to do is "Jim Along Josie" because it has lots of action and movement for my over active toddlers and preschoolers. It's from "American Folk Songs and Games For Children" and you can hear it here. Finally, we did "The Farmer in the Dell". There are lots of book versions, but it's loads of fun to act out, again with hats. If you have a "cheesehead" hat you are in luck for the ending. I have a prop cheese made of styrofoam painted yellow and with holes cut with an Xacto knife someone made for a display, or a simple cardboard version would be easy to create.